Professional Series Hammered KettleThe Ludwig tradition of Old World integrity and superior quality regulates every step of the process. The finest materials are chosen, then meticulously formed to deliver a clear, pure tone. The deep parabolic kettles are calibrated precisely to the pitch-centered tone needed to fill a hall. While kettles hang freely within an exclusive, sturdy double-ring suspension system, Ludwig’s proprietary profile mylar heads provide superior resonance in concert halls of all sizes. With an adjustable Balanced Action(TM) pedal system at its base, operation is smooth and consistent.Whether it’s performing more contemporary works or a traditional repertoire, the Professional Symphonic Series offers a sixth in range for maximum playability. 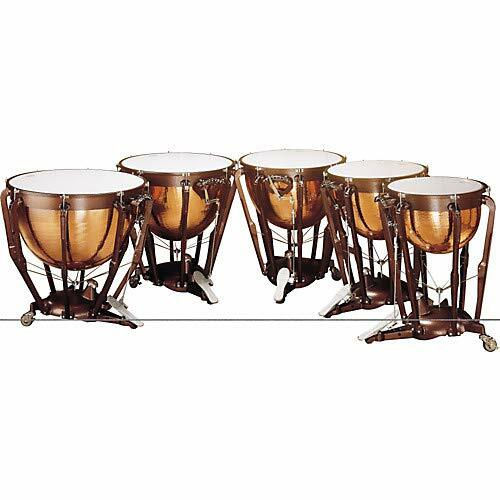 This includes the ease of fine tuning the balance of your timpani simply by turning the tension knob conveniently located just beneath the kettle for quick, minor adjustments that won’t interrupt your performance.